With its rich cultural tapestry, New Orleans was a logical place to begin our search for blues music. However, our day started with a different kind of hunt. 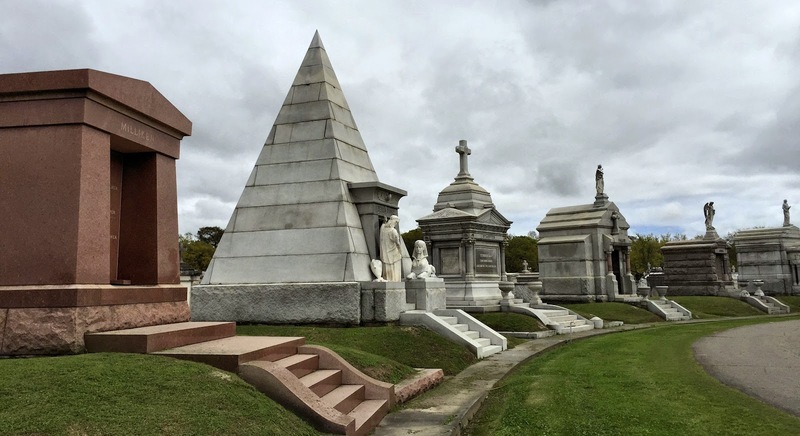 First stop was the expansive Metairie Cemetery, the largest in New Orleans with an impressive collection of Italianate, Gothic and classical marble tombs and elaborate statuary. 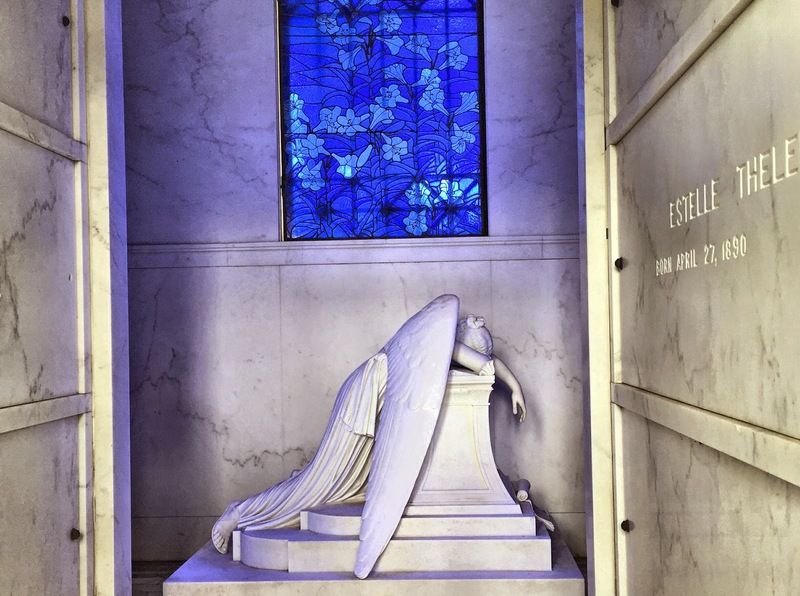 As we rambled among its labyrinthine lanes searching for a few letterboxes, we marveled at the ornamentation and variety of the monuments and wondered about the deceased who had inspired such tributes. 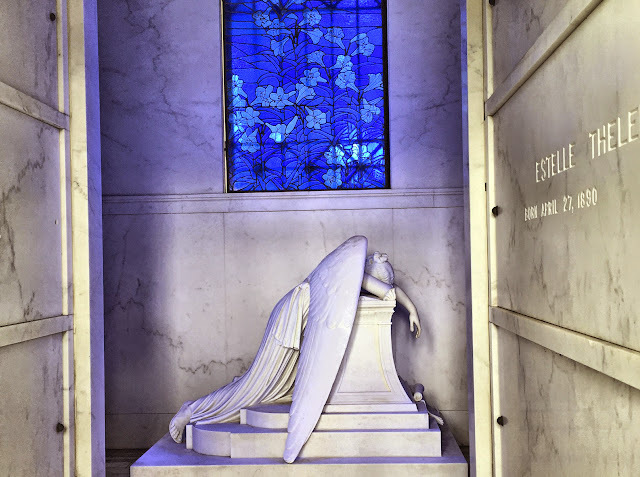 Secluded inside a Greek temple styled mausoleum was a mournful Angel of Grief, suffused in blue light from the cobalt-tinted window above her. The memorial was commissioned by Chapman Henry Hyams, an early twentieth century stockbroker and philanthropist in honor of his sisters. From the cemetery, we drove east to the nearby City Park, where we planned to visit the New Orleans Museum of Art, a major beneficiary of Mr. Hyams' generosity. Rather than seeing some of the many paintings he donated to the museum's collection, however, we found instead a "Closed Monday" sign posted prominently at the entrance. Of course, that also meant that the Museum Cafe, where we had hoped to eat lunch, was off the table. 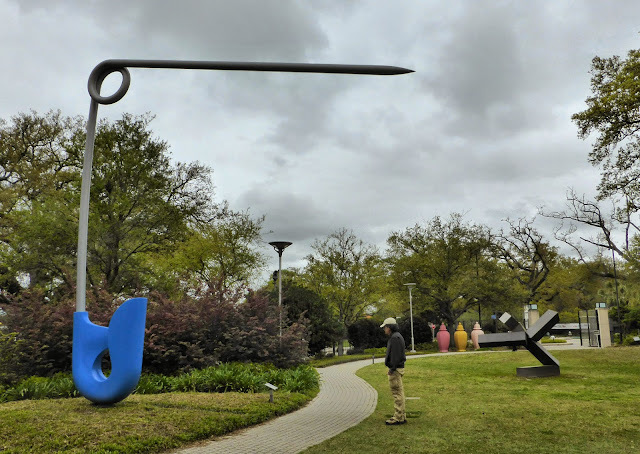 Fortunately, the Bestoff Sculpture Garden behind the museum was open and busy with visitors strolling through its handsome five acres of pathways winding through moss-draped trees and across lagoons, a beautiful setting for the museum's excellent collection of contemporary sculpture. 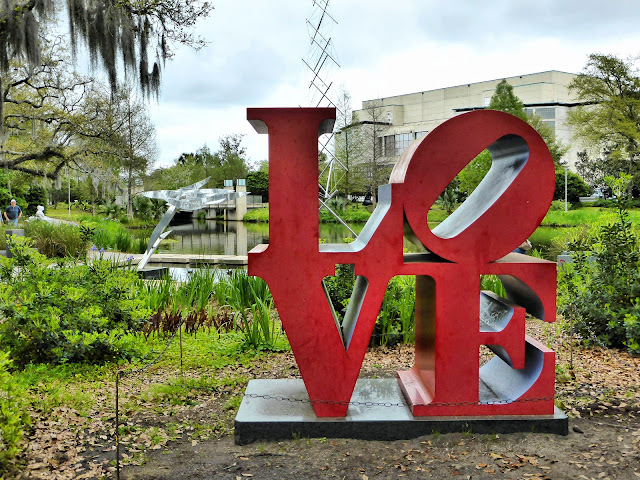 One of Robert Indiana's iconic LOVE sculptures is featured prominently and quite popular. At 72" square, this aluminum version of LOVE is half the size of the steel original at the Indianapolis Museum of Art. 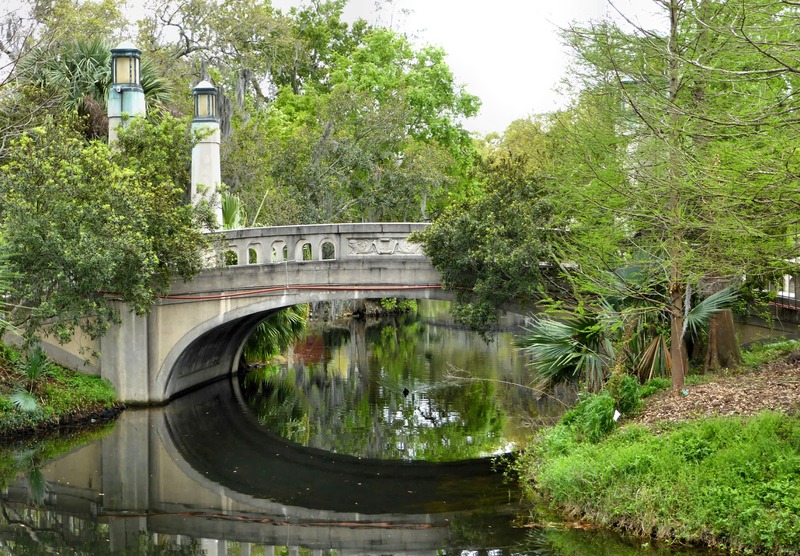 After our exploration of the Besthoff garden, we tracked down a couple of letterboxes elsewhere in City Park, one of the largest and most visited parks in the U.S. Established in 1853 along the remains of a bayou, the 1,300-acre park—one and a half times the size of New York's Central Park— was once a plantation, bequeathed to the city by its owner for use as a park. 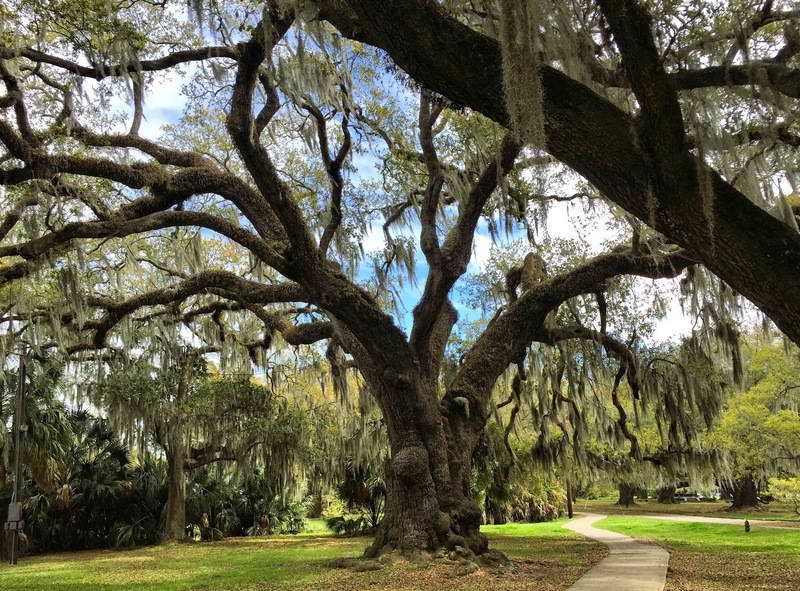 City Park is home to the nation's largest collection of mature live oak trees, some estimated to be more than 600 years old. After exploring just a fraction of the park, we finally tore ourselves away in the early afternoon, having munched on some fresh vegetables from our cooler for lunch. 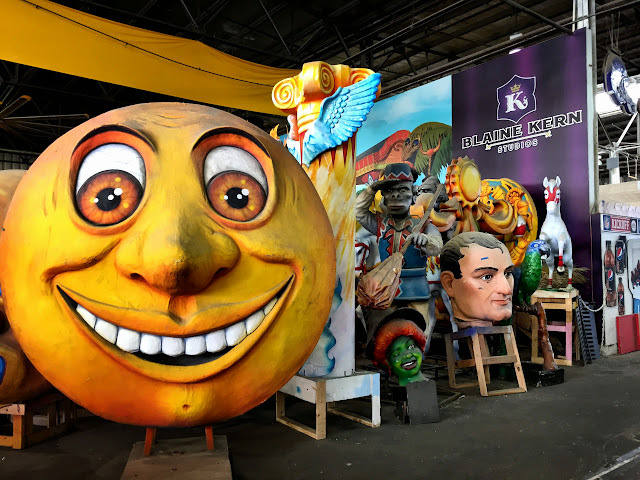 Our next stop was Blaine Kern's Mardi Gras World, a working warehouse where the fanciful and imposing floats for New Orleans carnival parades are built and stored. Heading across the Mississippi to Algiers on the west bank, where Mardi Gras World was located when I visited it with our yaya girls in 2005, we decided to check the exact address in the GPS. 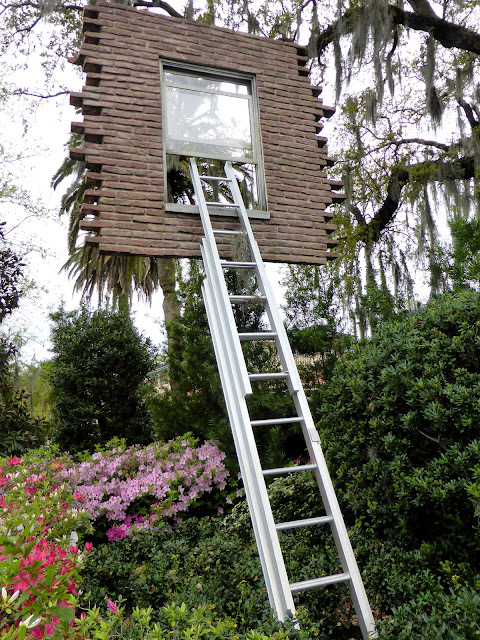 That's when we uncovered another time-wasting, traffic-choking error that a little planning could have prevented. 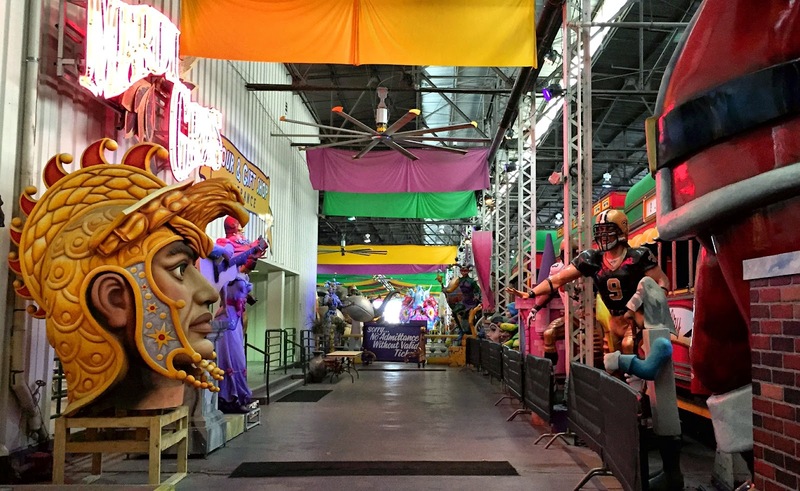 In 2009, the Kerns transplanted their growing operation to the east bank of the Mississippi River, conveniently adjacent to the New Orleans convention center and cruise ship terminal. 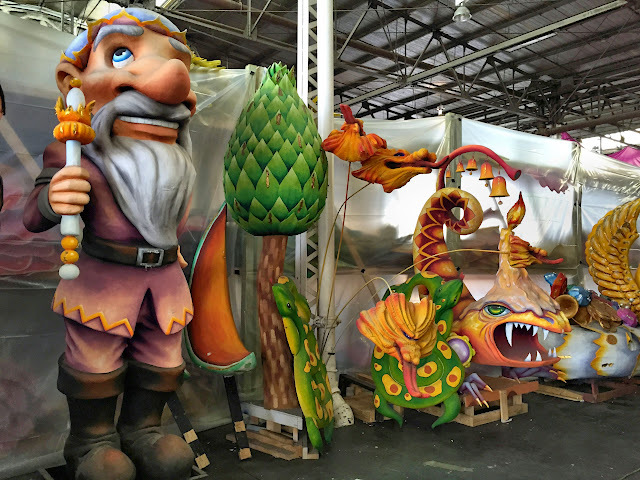 Available space expanded from 80,000 to more than 300,000 square feet to accommodate the thriving business, which transforms mundane slabs of styrofoam and plywood into massive magical, mythical and legendary figures for the towering parade floats. After paying $10 to park in the convention center lot, we ponied up another $36 for two admissions and began meandering around the warehouse while we waited for the beginning of the next tour. 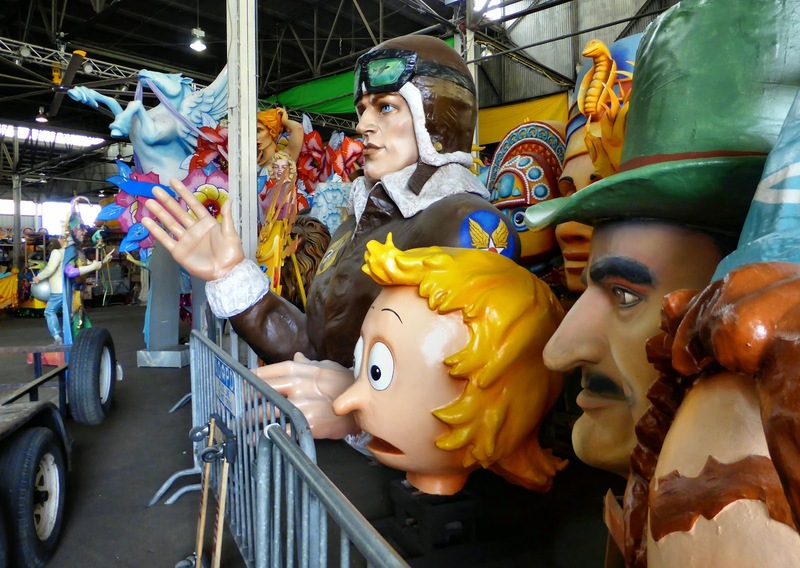 It was a bit like walking through the looking glass as we entered a surrealistic world where oversize aviation heroes shared space with cartoon characters, mystical beasts, native chiefs and Hollywood starlets, all in varying sizes. 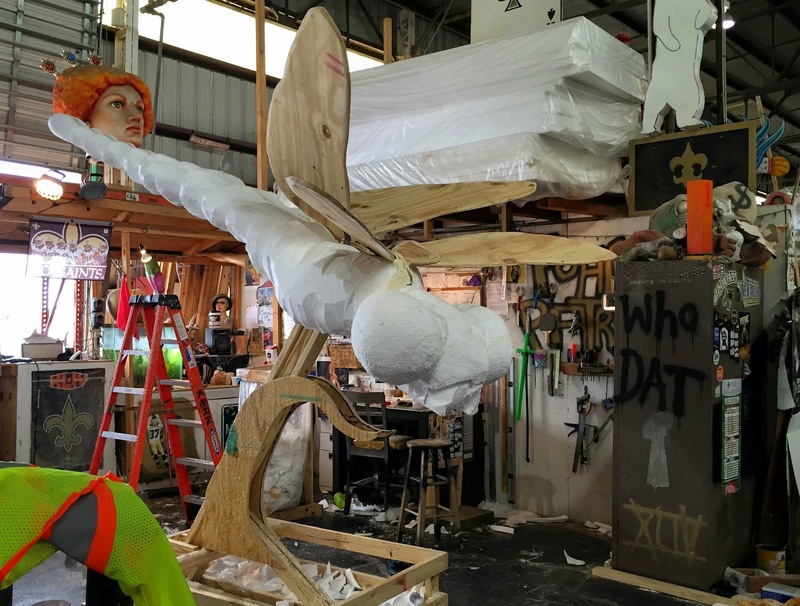 If the local Mardi Gras krewes (organizations that host parades) can imagine it, Kern Studios can build it. 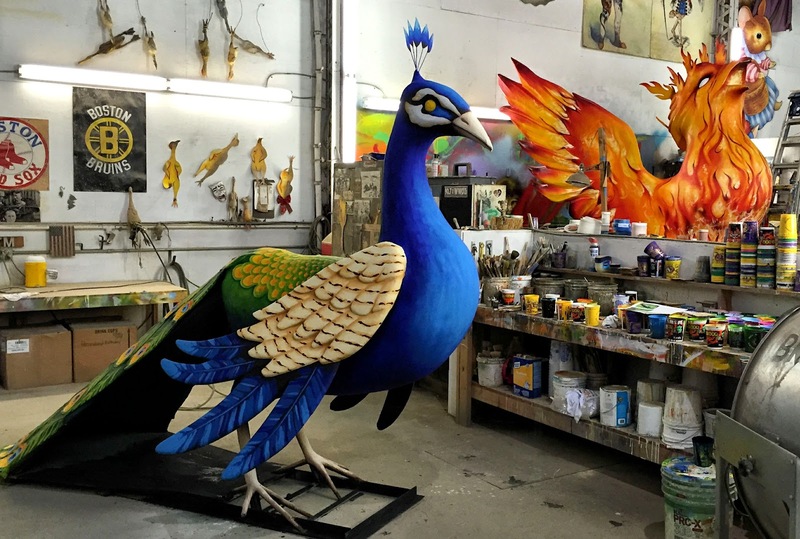 Nothing is too outrageous for these carpenters, artists and sculptors to depict larger than life—much larger. 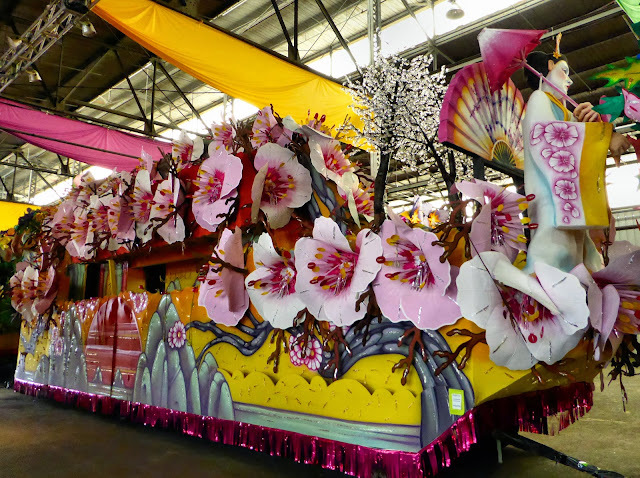 Each of the year's 60+ parades has a theme and all the 25 or so floats in each parade follow that theme. And as extravagant as some of the props are on these spectacular floats, local tradition holds that no prop can be re-used on another float in the future. So they sit and wait, this motley crew, in their bizarre world, biding their time until the day they can undergo reincarnation. Only here could Ronald Reagan be transformed into Sinbad the sailor, Richie Cunningham morph into Peter Pan. Our tour began with an excellent 20-minute film on the history of New Orleans Mardi Gras and Kern's involvement, followed by a photo op session with carnival costumes, which the 40 or so guests in our group eagerly embraced. The guided tour of the workshop enabled us to get a close-up look at how the magic is made. Since we had already wandered among the giants in the warehouse, we departed the tour after the workshop and made our way to Carondelet Street and checked into the new AC Hotel by Marriott. After dinner at a prosaic but convenient Thai restaurant near the hotel, we found ourselves ready to call it a day, exhausted from our day of haphazard roaming of the city. We were both in bed before 9 p.m., too tired to go hear music tonight. Mardi Gras Day is the only day when street masking is legal in the city (from dawn to dusk).